yoli is a revolutionary mobile language-education platform custom built for the mobile, on demand world we live in today. yoli connects eager English or Mandarin learners with awesome tutors on-demand, on mobile phones.. Think of it as UBER for studying spoken English. With a mobile phone and 15 minutes of free time students in China (the largest paying English language learner market in the world by far) can connect with native English speakers across the globe. With a 300+ class curriculum custom built by experts for the mobile platform, yoli has been an instant hit in China. Since launching on February 29, 2016, yoli has quickly become the number one English learning app on the WeChat platform (Wechat has nearly 900 million users). 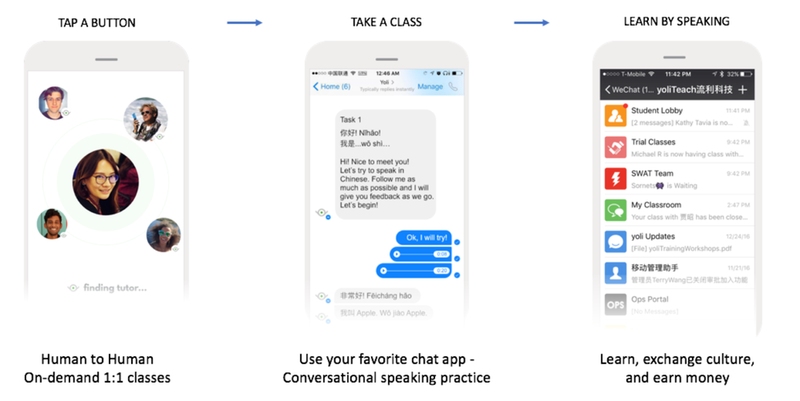 yoli now teaches thousands of classes per week on WeChat.